Earlier this summer something truly rare happened in Tibet: the Chinese government allowed a group of foreign journalists to tour the Tibet Autonomous Region. Actually, they didn’t just allow it- they organized the tour, and picked up the tab for the visiting journalists. The result has been some of the only positive press coverage China has gotten in Tibet in years, as in a series of articles by Vancouver Sun columnist Chuck Chiang (see here and here). Chiang’s articles attempt to give consideration to both sides of the Tibet question, and he includes some caveats in his assessments: in one article he notes that he has “a limited perspective,” and later writes that he didn’t spend enough time in the monasteries to comment on issues of religious freedom. But he doesn’t seem to have noticed the most important point: as far as Beijing is concerned his lack of familiarity with Tibet is actually his most attractive quality. His limited perspective isn’t a problem, but rather a chief selling point for the people who arranged his trip. Consider the cases of veteran China reporters with years of experience covering Tibetan issues: in the last few years they’ve been chased out of Tibet, denied entry to Tibet, entered Tibet only through subterfuge, sneaked into Tibet by bypassing police barricades, entered Tibet only through hiding in the back seat of a car (multiple times), and been forcibly expelled from Tibet en masse. The Foreign Correspondents Club of China has consistently found Tibet to be off-limits for foreign journalists, and has repeatedly (and unsuccessfully) requested access to Tibetan areas. In short, there’s no lack of qualified and motivated reporters already working in China who would eagerly report from Tibet, given the chance. Instead, Beijing arranged for a group of journalists from Canada to come on a meticulously-planned tour of Tibet as they would like the world to see it: a series of harmonious Potemkin villages, with hand-picked Tibetans and Chinese officials nearby to provide context. Chiang clearly tried his best to keep his reporting balanced, but how much could he do when he’s forced to rely on the director-general of the Lhasa “government information office” and staff from the China Tibetology Research Center for quotes? This preference for inexperienced participants can also be observed in the 2014 Lhasa Consensus, a government-organized conference which concluded last week. The conference, which issued a closing statement loudly endorsing all aspects of Chinese rule in Tibet and lavishing unqualified praise on its achievements, was attended by “nearly 100 speakers from 36 countries” according to China Daily. 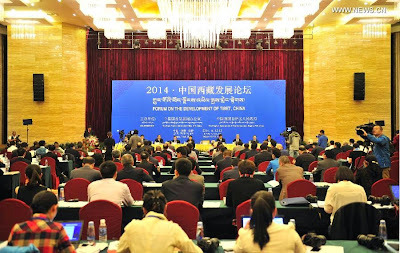 The caveat: China Daily admitted that “most attendants at the forum were in Tibet for the first time.” Also, at least one of the attendees subsequently complained of having been led to believe that the forum was focused on development, not politics, and objected to having been included in the “unanimous” closing statement, which included attacks on the Dalai Lama. With so many knowledgeable Tibetologists and researchers locked out of Tibet today, Chinese authorities instead granted access to (and put words in the mouth of) a select group whose members are mostly new to Tibet. One Lhasa Consensus attendee, a Lord Davidson from the United Kingdom, has already been the subject of controversy for a series of startlingly ignorant comments reported by the Chinese media. One of them, ironically, was a claim that foreign journalists don’t cover Tibet in person because of the “high cost” of reporting there, apparently unaware of the way authorities selectively allow and deny access in pursuit of their messaging and propaganda goals. Clearly, if the situation was as rosy as they say there wouldn’t be any need to block experts in favor of amateurs. Warning: The safety of links to Chinese news sites cannot be guaranteed.